Happy Leap Year 2016! Seems like a perfect day for a jumping frog. What with the leaping and all. Yeah? Huh, huh? All right! So, I hadn’t read this one since seventh-grade, and I was surprised to learn upon re-reading that nothing all that funny happens. I remembered it as some kind of slapstick comedy but it’s really not. The joke isn’t in the story; it’s in the telling. 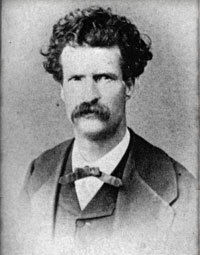 Twain gently mocks/salutes the notion of American tall tale. The layers of storytelling make the whole thing completely unreliable. The details the storyteller pick out to relate are preposterous. So it’s actually very sophisticated comedy, and very funny at that. And that’s quite a trick on Twain’s part. This may be an obvious choice when a person’s surveying Short Stories but your commentary’s a real smart slant. I always learn new ways of thinking/reading from this webpage. Thanx. Not sure about any “real smart slant,” but thank you!